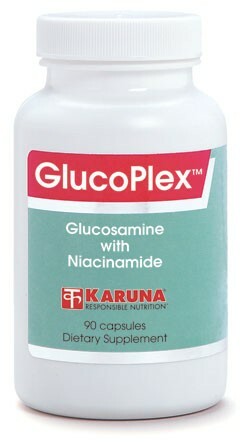 GlucoPlex contains an array of nutrients that participate in maintaining the integrity of healthy connective tissue. Glucosamine sulfate and niacinamide are both well-documented as effective promoters of healthy joint function. Potassium chloride (KCl) is a more expensive stabilizer of glucosamine sulfate, but is often preferred over sodium chloride (NaCl). Niacinamide has a long history of clinical investigation for its effects on improving joint function (J Int Acad Prev Med 1983;Winter:5-25). A recent double-blind trial found niacinamide safe and effective for helping to maintain long-term, comfortable function of joint structures (Inflamm Res 1996;45:330-34). 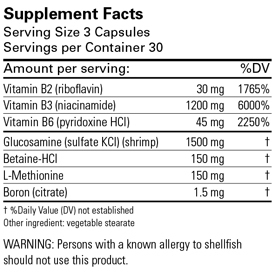 Suggested use for adults: Three capsules daily with meals, in divided doses, or as directed.